This work was supported by the Scripps Seafloor Electromagnetic Methods Consortium. Gemini Prospect, Gulf of Mexico (GoM) has served as the test bed deployment site for the development of a broadband marine magnetotelluric (MT) method. Located in 1 km deep water, Gemini contains a complex three-dimensional (3D) shaped salt body at depths of 1-5 km beneath the seafloor. The high electrical resistivity of the salt contrasts greatly with the surrounding conductive sediments and provides a suitable target for electrical methods. Using a broadband MT instrument that responds to higher frequency electric and magnetic fields than traditional marine MT systems, we have collected 42 sites of MT data in the period band of 1-3000 seconds in a two-dimensional (2D) grid over the Gemini salt body. This is an excellent data set for testing marine MT’s ability to map salt structures and also for developing and testing 2D and three-dimensional (3D) modeling techniques. 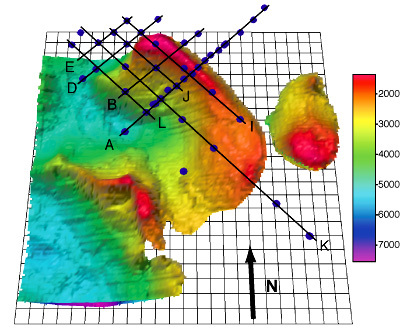 We present 2D models obtained from inverting subsets of the MT data, along with a comparison to the Gemini salt volume boundaries obtained from high resolution 3D seismic data. While some of the 2D inversion models recover the salt boundaries remarkably well despite the complex 3D shape of the Gemini salt body, the results are heavily dependent on the electric field orientation of the impedance tensor component being inverted. Our experience suggests that inverting the impedance component with the electric field perpendicular to the dominant structural strike yields the best agreement with the seismic salt structure. Synthetic 2D inversions of the 3D MT forward response of the salt volume are used to validate the observed sensitivities. 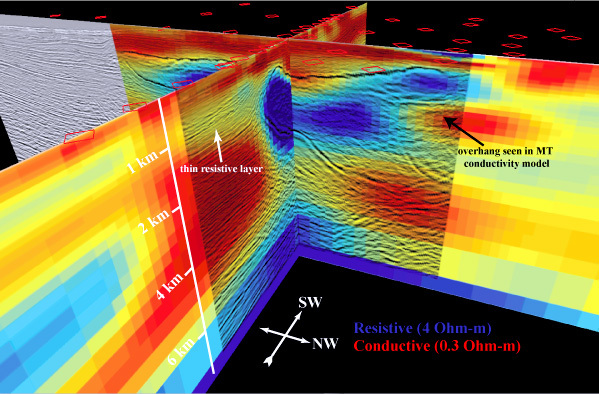 An improved structural interpretation is available through the joint analysis of the combined depth migrated seismic reflection and electrical resistivity models, illustrated by correlated features in the reflection and resistivity images.